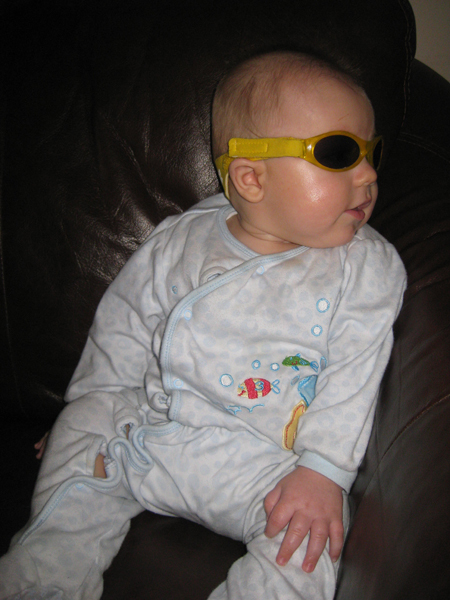 As I was thinking about how great it would be to own baby sunglasses, I realized that Niko actually already had a pair – another wonderful hand-me-down from his cousin John Russell (and a good example of me being able to claim “baby brain” to excuse my forgetfulness). For it wasn’t until I realized he needed them that I realized we had them! Of course when you’re out and about in the sun, it’s a little too late for that memory of be of use, especially considering I had no idea what “safe place” I had put them in. After returning home and going through a few possible “safe places” I hit the jackpot and found the shades! 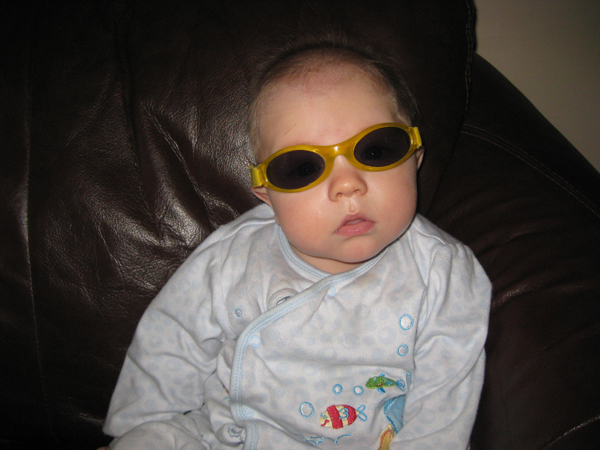 Today my entourage and I headed out again, but not before I remembered about the Baby Banz, as they are called. I put them on Niko while we were still inside, just to test them out and his reaction was hilarious! He was moving his head all around, quickly from left to right, looking up and down, rapidly checking things out in this new darker world (and I caught a moment – albeit not the best one – of it on video). 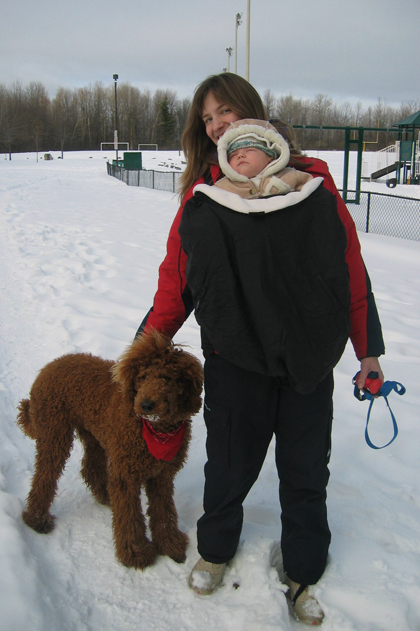 Anyway, he seemed to tolerate them pretty well, so I bundled him up and away we went. 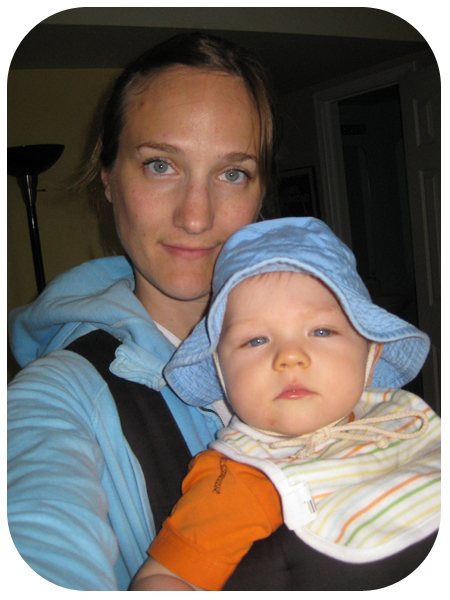 I happened to bring along my digital camera as I wanted to take some pics for a project I am working on for my nieces and nephew, and the camera also afforded me the ability to check up on my little guy who is front facing in the carrier and completely out of my view: by snapping a quick picture I could easily see what he was up to. Good thing I had the camera, because at one point I noticed the Baby Banz were, let’s just say slightly askew, as you can see in the accompanying picture below! 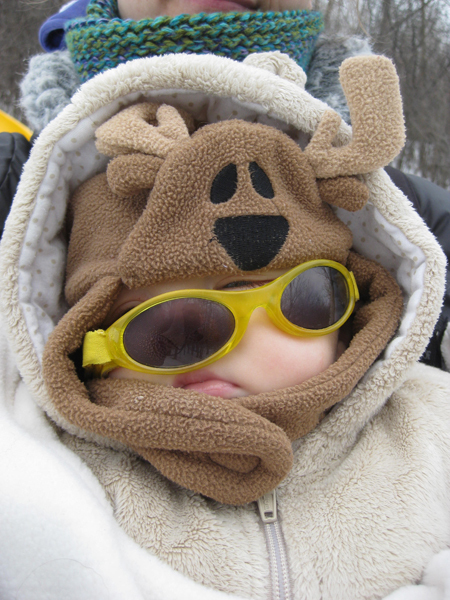 Note to self: Next time we bust out the sunglasses for Niko, strap them on a little tighter Mom! Now that the hustle and bustle of the holidays has pretty much come to an end, I am again left to my own devices with little Niko and Frasier, and face the daily challenge of bringing the poodle for a walk! Today I had the brilliant idea (well, I thought it was brilliant) of bringing along a (rear-view) mirror. 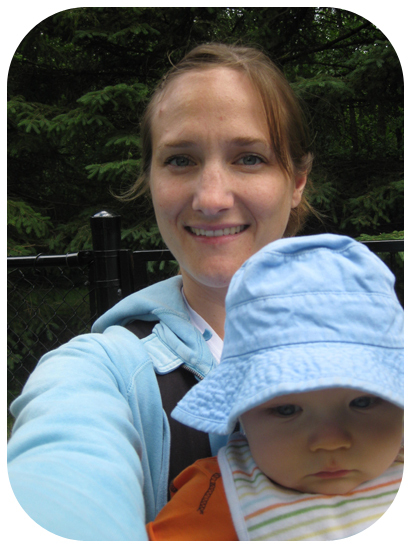 The baby carrier I use has Niko front facing, and only with the mirror in hand, can I clearly see the little tyke. 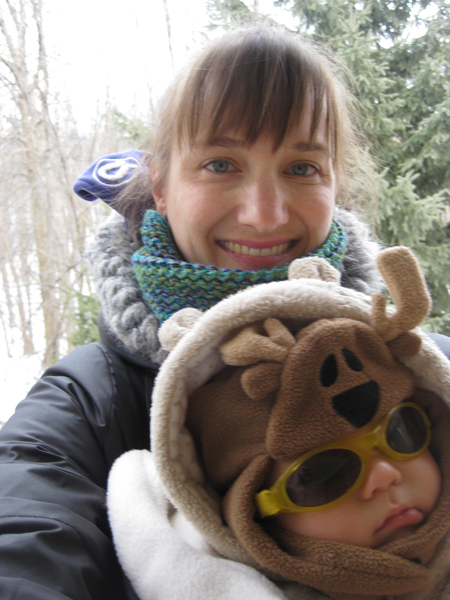 So, once I had Niko all bundled and comfortably strapped into the Baby Bjorn – I headed out into the fresh air. I brought along the mirror for monitoring him, but the only thing that he really got up to on the walk, was blowing a tonne of bubbles (as well as catching a few zzzs)! I am not sure why he would want to blow bubbles in the frigid air (-10), but he blew the most bubbles I had ever seen, and because of the handy mirror I was able to wipe them off, instead of having them freeze into little face-cicles. Note: This picture was taken when Ciocia Ola was in town, but this is pretty much how we look on our rear-view baby walks – just imagine a mirror in my hand as well.